Vyrzhikovski was born in Irkutsk. He studied at the Repin Institute in Leningrad from 1948 to 1954 and began exhibiting in 1952. He was an accomplished painter of all genres. His 1957 painting, “Portrait of My Granny,” is well-known in the West. 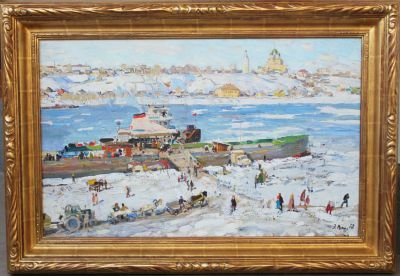 He was a member of the Union of Artists of Leningrad and participated in numerous exhibitions throughout his career. He is listed on page 350 of Matthew Bown's, A Dictionary of Twentietch Century Russian and Soviet Painters.